I’ve been eagerly awaiting the postman to deliver something special and today was the day! Faerie Magazine Summer 2014 issue 27. 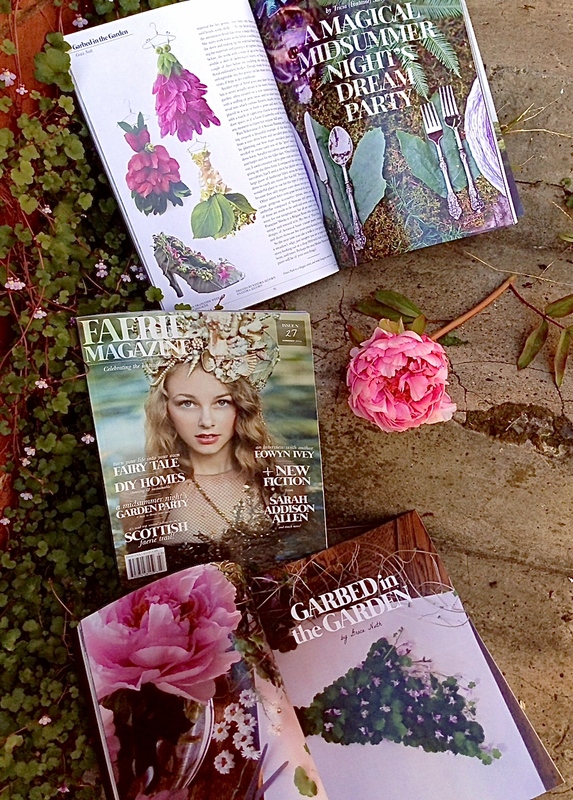 My Garden Fairy’s Wardrobe is featured along side the work of floral artists Pam Yokoyama, Vashti Cassinelli, Zita Elze and Francoise Weeks. There’s also lots of other gorgeousness for inspiration in the garden, entertaining and some magical travel destinations. You may recognise the article feature photo is similar to my blog ‘about’ page. The peony tree those peonies came from has just started to bloom again this week – Spring is on it’s way! Grape hyacinths are adding a splash of blue everywhere and the air is perfumed with the scent of jonquils. Another exciting thing to happen is our new deck at the bottom of the garden was completed yesterday and it’s going to be a special spot. I’m looking forward to lazy days and balmy nights. Long Sunday lunches and drinks with friends. Quiet mornings with a pot of tea. Sharing laughter, conversation and just being. Congratulations. Your art is equisite.